1. Using a page protector that is open on three sides, open it and place several drops of a lettuce re-inker and open and close the protector several times. 2. Place 2 quarter sheets of glossy paper back to back (so the glossy sides are facing out), inside the protector, close it, rub it and remove the paper. Now you have a great background! 3. Let the paper dry and stamp your image with black Stazon Ink, then color with markers. 4. This was layered onto plum and olive papers, glued to a kraft colored panel with the top corner torn and mounted to a plum card. 5. Stamp the sentiment at the bottom with black StazOn ink. 6. Apply square stickers to the right side. 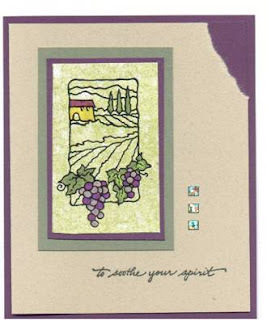 What a lovely card - reminds me of cards I see for sale in the wineries in Napa - love it! Gorgeous card Jamie. Wishing Greg good luck for Monday. Jamie: this is such a lovely card. I also adore the 4th of July card with the birdie, how tweet lol. I have nominated you for a "Brilliance Award." Please go to my blog and retreive your award. I love your technique with the glossy paper background, i am going to have to try that one! Pretty card! thanks for the tutorial! I just bought some glossy paper, not sure mine will come out as nice as yours though! Very pretty card! Thanks for visiting my blog too! I love your 4th of July chick cards too! Thanks for sharing!!! This remembers me of a technique I wanted to try for so long that when I finally got a few glossy papers I haven't used them. Now I'm itching to. Very pretty! I love the image!!! Oh, my goodness! I love this! We love wine and wineries at our house so we are right with you! Time To Start On Christmas Cards!